"What happens when a man stands up and says enough is enough." Paramount has officially debuted the first trailer for Ava DuVernay's Selma, one of the last films we're waiting to see for the awards season, as it hits theaters on Christmas Day just in time for a qualifying theatrical run. Telling the story of of Dr. Martin Luther King, Jr.'s historic march that started in Selma, Alabama in 1965, this powerful portrayal of the civil rights movement is lead by David Oyelowo. He looks exceptional as Martin Luther King, even putting on a bit of weight to complete the appearance, and I can't wait to see the entire thing. The cast includes Tom Wilkinson as President Lyndon B. Johnson and Dylan Baker as J. Edgar Hoover. Don't ignore this film. Selma is the story of Dr. Martin Luther King, Jr.'s historic struggle to secure voting rights for all people – a dangerous and terrifying campaign that culminated with the epic march from Selma to Montgomery, Alabama, and led to President Johnson signing the Voting Rights Act of 1965. Selma is directed by Ava DuVernay ("Scandal") from a script she wrote with first-time writer Paul Webb. When the film is released wide in 2015, it will mark the 50th anniversary of the iconic marches. David Oyelowo (Jack Reacher, The Butler) stars as Martin Luther King Jr. along with Carem Ejogo as Coretta Scott King, Tom Wilkinson as Lyndon B. Johnson, Cuba Gooding Jr. as Fred Gray, Common as James Bevel and many more. 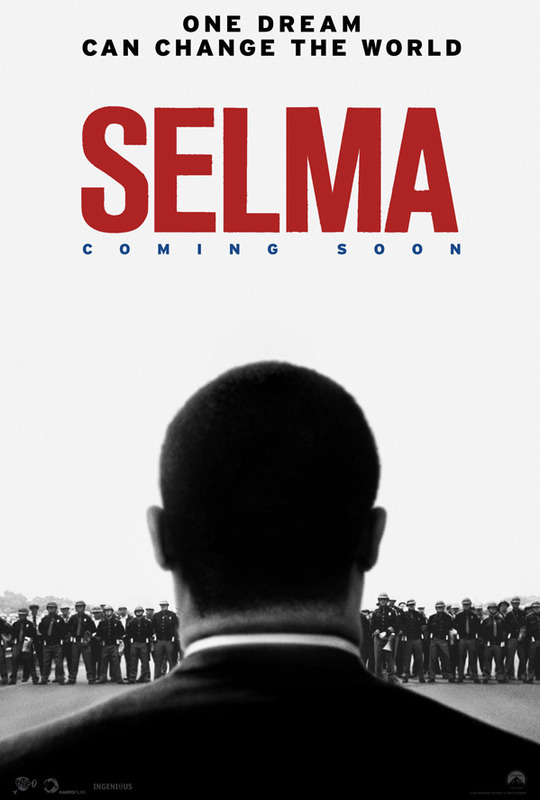 Paramount will release Selma limited on December 25th, 2014, before expanding wide in January 2015. Stay tuned. "Los Angeleeees..." Looks good. // I wonder if MLK Jr. would approve of hip-hop music in a film about his life? Hmm. I think if he were alive today he definitely would, as its a genre that his audience identifies with so heavily. His audience? did you really just write that on a an article/ film about fighting for racial equality. Did you really just get offended at the innocuous use of the word "audience" to describe people attending a speech? Yes? Sorry, didnt intend to offend you here bro. This trailer was brilliantly edited. Looks pretty good. I hope it's rated R...but probably not. No mention of Tim Roth in the description? This turned out to be a very non sequitur comment... Crocodile Dundee is an underrated movie. Any idea name/artist of the song towards the end? The Butler (w/ Forrest Whitaker) is another excellent look at that period in history. My mother remembers the Freedom Rides quite clearly, and had a hard time w/ some parts of the film that deal w/ the son. I wasn't a big fan of The Butler, thought the movie was quite uninteresting actually. Not the subject of the movie, mind you, but the movie itself. For me, movies like "Mississipi Burning" and "Do the right thing" are still up there as the best (most effective) movies on this subject. The music is by Public Enemy, sort of the opposite end of the gangster rap spectrum in that they aren't gangster rappers. Their music is positive. The only lyrics are 'The People' and 'This revolution goes on and on...' neither of which are gangster. Gospel music, as much as I like it, doesn't have the power of Public Enemy. That's not gangster rap... :/ Honestly I just saw the trailer and I think it gives it some special punch, no? I agree. And so are the cops in this country. The Ferguson rioters need to watch this movie because MLK is rolling over in his grave. And I know many of the rioters are probably only in their 20s and teens and didn't grow up in those times knowing what it truly was like to be segregated. Many of these black people today are segregating themselves by their own self pity, victim mentality, and negative attitudes. This is sure not what MLK intended as black folk to be and act like, and especially not to commit crimes. The black folk in MLK's day were protesting because black people couldn't vote or eat or sit where white people were, or get paid the same amount of money as white people doing the same jobs. He didn't intend for it to be about black criminals getting "rights". It's not white man's fault you choose to steal and do drugs and riot and loot. It's your fault. It is just a shame that these black people forgot where they came from. Jesus, we have a black POTUS for God's sake, and MLK would be amazed at the progress blacks have made. Sure there is still racism, but these race baiting blacks can get off their asses and get a serious attitude adjustment! They can pay attention in school, go to college, study, and do the right thing and that will go a long way. President Obama didn't riot and loot to get to be the POTUS. He paid attention in school, worked hard, and had goals for himself and didn't walk around like a gangster thug. "The Ferguson rioters need to watch this movie because MLK is rolling over in his grave. And I know many of the rioters are probably only in their 20s and teens and didn't grow up in those times knowing what it truly was like to be segregated." Firstly, sure you are talking about the few rioters, not the thousands and thousands of people PROTESTING all over the world. There will always be people rioting. The other day several hundred white people rioted because their hockey team won. Please don't generalize 'black people'. When you write something like that you sound excruciatingly ignorant. "Many of these black people today are segregating themselves by their own self pity, victim mentality, and negative attitudes." Even though decades have gone by since MLK 'black people' are still disenfranchised in every aspect of their lives. You just don't see it and never will. From education, to work, to how much you make, to just driving sown the street. Are there @*&# thug black people in this country and around the world? Of course. Are there idiod *&^# white trash people on the planet and around the world? F yes there are! "Jesus, we have a black POTUS for God's sake, and MLK would be amazed at the progress blacks have made." Didn't you read the Chris Rock joke from last month that was so perfect for this statement? He said, "I love how people say look at all the progress black folks have made over the years...it's not the black people that made progress, it's the white people who decided to be less racist." 60% of welfare and food stamps go to white people. Maybe these people need to get off their asses and go to school and stop acting like thugs. Most meth is made by white people. Same for them. Come one you really want to lump an entire race into your simple view of the planet? Maybe instead of making fun of rioters, you should actually go out and join in the protests. Im not kidding. I walked with my family and friends and we're white and guess what, 99% of the people protesting are regular people trying to live their lives and make progress around the world for all of us. Because guess what, there are many injustices the cops are doing from incarceration, to ticketing and preying on poor people, to killing innocent people. It's not all 'black and white' as it is in your brain. Seriously get out of your trailer every once in awhile. It's a big world out there. Try it sometime. Hmm, gonna have to eventually check this out. Been waitin on a big screen MLK movie for years now. Just wish, and no disrespect to the director, it was made by a more well known director. Films aren't needed to remind Americans of racial inequality.